So, yes, as sports fans, we are intrigued by athletic families. How many times have you seen a joke about Boomer Phelps being an Olympic Champion in by 2032 or 2036? We see someone achieve greatness, and then we turn to their next of kin to see if they are on the same path, or if they are excelling in whatever they’re doing. Comparison is a widely-used metric for gauging athletic performance, and family simply heightens that comparison. Right now, there are two particular college sophomores in the NCAA who live in the world of comparisons based on their famous last names. Both have fathers who were Olympic Champions, former world record holders, and trailblazers in the sport– they’ve even gone head-to-head. Indeed, in 1992 at the Barcelona Olympic Games, Gustavo Borges of Brazil beat American Matt Biondi in Biondi’s primary event, the 100 free. Borges earned the silver behind Alexander Popov, while Biondi settled for fifth. Biondi still held onto the World Record, which Popov couldn’t touch (at least not until 1994). Both Borges and Biondi were titans of the sprint freestyle in their time. Borges competed at four-straight Olympics, from Barcelona to Athens, and collected four Olympic medals, two long course Worlds medals, and ten short course Worlds medals, including four short course World titles. Borges also held several short course World records. Biondi broke Rowdy Gaines‘ 100 free long course WR in 1985 with a 49.24, then broke it three more times in the ’80s, until it settled at 48.42 in 1988 and stood for six years. 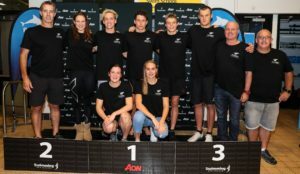 With no swimmer breaking 48.0 until the 21st century, Biondi was well ahead of his time, and was known for a whopping five gold medal performance at the ’88 Games as he chased Mark Spitz’s record of seven golds. 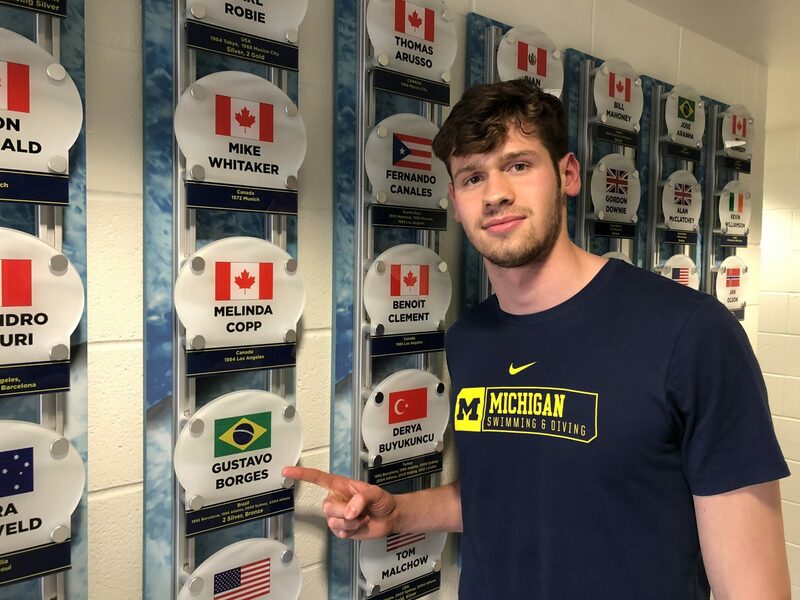 While not on quite as grand a stage as their fathers, Luiz Gustavo Borges and Nate Biondi are continuing swimming legacies at Michigan and Cal (which is where Gustavo and Matt went, respectively). Borges has emerged as one of Michigan’s top sprinters, successfully transitioning from meters to the NCAA yards system, while Biondi continues to improve at Cal and hit a notable milestone at the UGA invite, a meet at which both boys competed. Borges took off as a freshman, getting down to 19.26 and 43.03 in his first-ever yards season and swimming for Michigan at the 2018 NCAA Championships. He’s elevated that already this season as a sophomore, throwing down lifetime bests of 19.11 and 42.53 and adding 18.89/42.00 relay splits at the UGA Invite last weekend. He’s now the Wolverines’ top sprinter in both the 50 and 100 free, and has rotated in as their trust medley anchor as just a sophomore. Biondi, meanwhile, did not come to Cal with ludicrous sprint times. When he announced his verbal commitment in November of 2016, he was 21.26 in the 50 free, which is not the kind of time many people are used to seeing going to swim at Cal. Biondi chopped that all the way down to a 20.27, though, at the 2017 CIF D3 Champs. 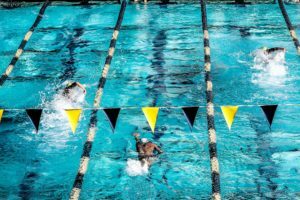 Growing up playing basketball, soccer, and water polo in Hawaii, Biondi didn’t focus on swimming year-round until high school, so some late progressions were expected. After not making the 2018 Cal NCAA team and not improving upon his high school 50 free best, Biondi rocked a milestone 19.91 at the UGA Invite last weekend, his first time under 20 seconds, as Cal’s B relay lead-off. He also broke 44.0 for the first time in the 100, clocking a 43.77 to win the B final. It’s a reach to expect these boys to do exactly as their fathers did– what do we really gain from those kinds of expectations? That isn’t to say they won’t go on to win NCAA titles and eventually Olympic medals. But, it’s compelling to appreciate their strides in college thus far, and put their swimming in familial and historical contexts. And, next year, a new legacy will form at NC State, as Katharine Berkoff, daughter of American swimming great David Berkoff (who medaled at those same ’92 Olympics where Borges beat Biondi), will start her freshman year in Raleigh. Nice article, but a correction at the end – David Berkoff went to Harvard, not Stanford. Cool that a guy who was known for “doing for the little guys” and not being blessed with freakish genetics, has probably the best of the “legacy” kids in Katherine and another kid who’s D1 level. Though Nate Biondi’s legacy of outlandish genetics may see him win the battle of the Olympic offspring yet! Give some respect to Cale! Matt Biondi set the world record at the 1988 Olympic trials in Austin, not 1992. I was there watching in Austin and it was incredible. Berkoff’s 1st 2 WRs were at the same meet. 2 of the most memorable swimmers of their time without a doubt . I watched the 88 games and i thats what got me into the passion for swimming . Thanks for your article, Mr. Ortegon, I really enjoyed it and I’ve been looking for an update on how Nate Biondi was doing at Cal! All 3 of the athletes whose children were mentioned in your piece were heroes of mine when I was younger. One correction though, David Berkoff graduated from Harvard, not Stanford.